Without question, one of my biggest traits, is endurance. I also believe this is one of the most overlooked traits. Sometimes there is too much focus on being creative (I still believe I'm very creative indeed), but not that much focus on actually having the interest in putting in the immerse level of hard work (and honestly, quite boring tasks) over a long time to actually implement a new idea. Being born at a farm is a great foundation for endurance. Especially if it's focused on forestry. I then spent pretty much all my spare time between 12 to 23 years of age in the sport of orienteering (Top 15 in Sweden as Junior). For example; 25 Tiomila races (including 3 'Långa Natten'). In 2007 I finished my first triathlon race over the 'Ironman' distance. Best time so far being 12h 50min. 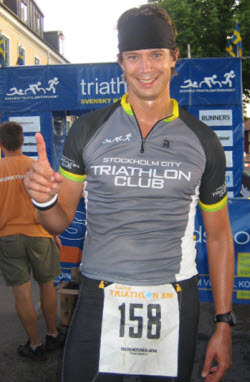 The race was Kalmar Triathlon, also known as"Järnmannen". The only race in Sweden on the full distance and is since a few years an official Ironman competition. To learn the story behind Ironman; watch this "... brag for the rest of your life..."video. It took a year of preparation but in 2011 I together with my friend Martin reached our goal; to finish 'one of the toughest 1-day races in the world', the Swedish 'Ö till Ö' challenge. A truly amazing adventure in the Stockholm archipelago (from Sandhamn to Utö). "Teams of two race together from island to island (Ö TILL Ö). The teams swim between the 19 islands and run on them. The total distance is 64 kilometres of which 10 km are swimming and 54 km are running." All in all, an epic event that I'm very proud to have finished. Not to to mention the fact that we finished as team 32 out of 73 with a time of just over 13 hours. Exhausted but delighted team of Martin Johansen & me. I believe that Financial Times got it rigth; "Endurance is the new golf".